Italian Meringue Buttercream & some impromptu red velvets. This is the buttercream that took me a couple tries to perfect. I couldn’t keep making frostings and icings with so many cups of confectioners sugar because they were way too sweet! These confectioners sugar based icings take away from the flavor and textures of the cakes I bake. Some buttercreams call for 6-8 cups of conf. sugar with a pound or so of butter!! I honestly can’t imagine giving that to people. I’d feel like I’m handing them diabetes! So I searched long and hard for a buttercream that didn’t use confectioners sugar and this is just one variation (the most difficult, but most gratifying one). The sugar syrup is flexible, you can use less sugar syrup but you’ll have a more buttery icing. Unfortunately, if you don’t use enough butter, it won’t hold together. I’m working on a splenda icing (we’ll see how that goes lol). The instructions are super specific because it’s got temperamental ingredients but it’s really pretty easy. **First, pour the eggwhites into the kitchen mixer with whisk attachment. Place sugar & water in a sauce pan and bring it to a boil on medium high temperature. If you have a candy thermometer, set it in the pan as well. When all sugar syrup has been added it should look thick and fluffy. Stop the mixer and change for the paddle attachment. Set the timer on 10 mins and beat on high speed. This is how long it usually takes in my mixer for the mixing bowl to be cool to the touch. You can put ice packs at the bottom and sides of the bowl to speed up cooling. Time to add the butter. Start the mixer on high speed and cut pieces of the butter into the meringue. When all butter is added it will not take long for mixture to turn into a thick, smooth, buttercream. When that happens slow down the mixer and add 1 tsp of vanilla extract (or whatever flavor you want). Stop the mixer and scrape down the bowl and start again. I do this two times and then the buttercream should be ready. Note: If buttercream won’t combine, just continue to whip whip whip. At some point, it will look curdled (like cottage cheese) but It will eventually get smooth. If you are still having problems, put the whole bowl with paddle attachment into the fridge and let it “cool” down a bit and then whip it again. Or use the ice bath again and use a hand mixer. This is why it’s important that the sugar syrup was the right temperature and consistency, and also that the meringue was cooled before putting in the butter. 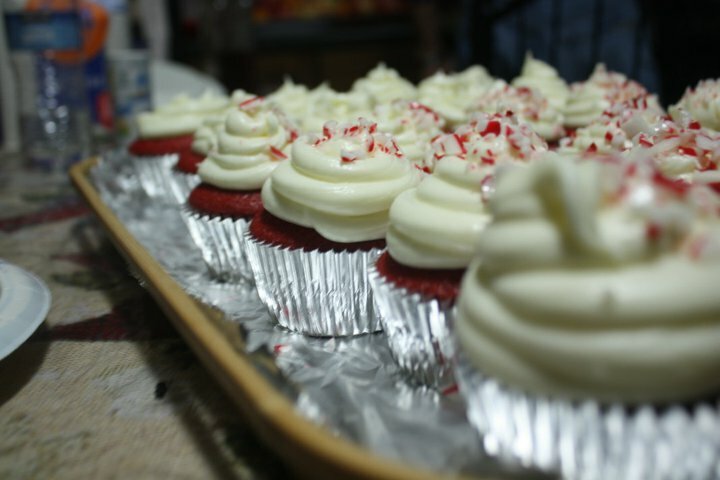 Made some red velvet cupcakes with my cousins for christmas and we crushed some candy canes and threw them on top. They were so yummy! 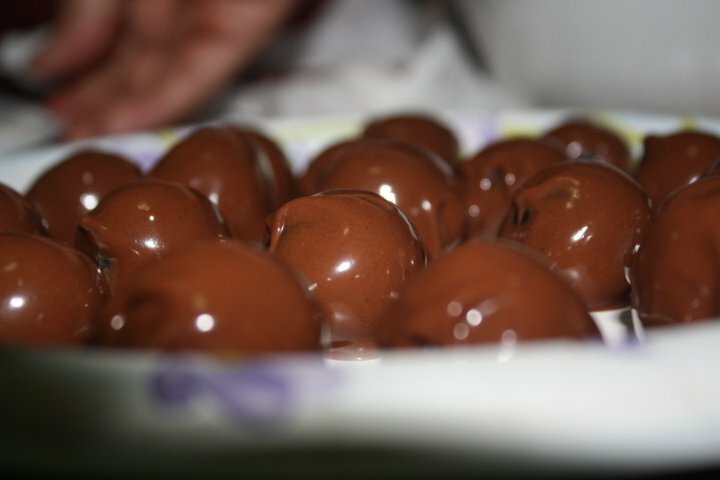 & of course, the favorite, oreo balls. I didn’t have candy melts so we used nestle milk chocolate chips.